Emu oil is a substance that is extracted from the fat deposits of the Emu, a flightless bird from Australia that resembles a small ostrich. Emu oil is a greatly beneficial oil that has been used for a wide variety of conditions. It’s been known to improve cholesterol levels, aid weight loss, relieve sore muscles, aches, and joint pain, promotes the healing of burns and wounds, treats several skin disorders, etc. Not only is emu oil good for humans, but dogs can greatly benefit from it as well. Emu oil has been used for veterinary purposes on horses, dogs, and cats alike. It has been reported to be greatly efficient in reducing the swelling of joints, calming skin irritations, and much more. Emu oil can even be taken internally to reap all the benefits this oil has to offer. 2 Benefits of Using Emu Oil on Your Dog. 2.1 So, is Emu oil good for dogs? 3.1 So, is Emu oil safe for dogs? 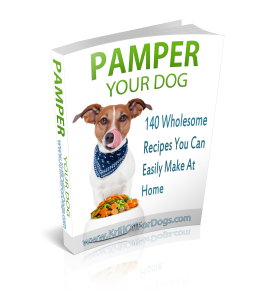 4 How to Use Emu Oil for Your Dog. 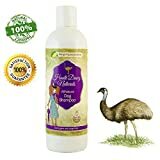 BEST DOG SHAMPOO, ALL NATURAL, EMU OIL, HELPS ITCHY DRY SKIN, RELIEVE PAIN FROM FLEAS & TICKS, FROM HAUTE DAWG NATURALS, MOISTURIZES, MANGO PAPAYA SCENT, BIODEGRADABLE, HAVE PET FEEL CLEAN & FRESH NOW! Benefits of Using Emu Oil on Your Dog. Just as with any substance or supplement, it’s normal for you to ask “is emu oil good for my dog?” especially upon realizing that it comes from a flightless Australian bird. Much like fish oil, but without the fishy smell and side effects, emu oil can be used as a dietary supplement to keep your dog’s coat shiny and maintain his/her overall health. Emu oil can even be used externally as well without leaving your dog smelly, overly greasy, nor sticky. Your dog can even lick the emu oil off its coat without being in danger of any side effects. Reduced swelling and joint pain. Prevents cracked or peeling paws. Softens rough and dry paw pads. Reduces skin irritation due to allergies, dermatitis, fleas, etc. Improves dry and flaky skin. Helps heal sores, cuts, burns, wounds, and parasite bites. Maintains heart and nervous system health. So, is Emu oil good for dogs? Besides being a great anti-histamine and anti-inflammatory substance, emu oil’s properties makes it great not only for dogs, but for many other animals as well, specifically horses and cats. It has been reported to have been used on koalas, kangaroos, and even possums! With the rising concerns surrounding the safety of the ingredients that we feed/apply on our dogs, it’s always logical to wonder whether something new can be harmful to your pet. So is emu oil safe for dogs? What are the side effects of using it? So far, usage of emu oil on humans has not shown to present any side effects, therefore it is widely assumed that it’s safe for dogs as well. Pet owners that have successfully used emu oil have only reported a transition period after incorporating emu oil to their dog’s diet. 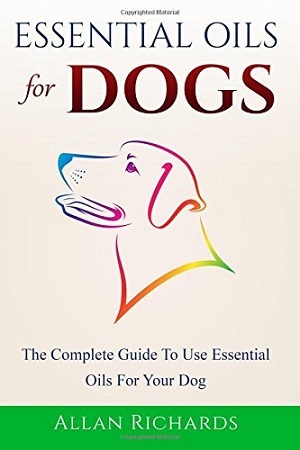 Your dog might present diarrhea or frequent defecating the first few days of ingesting emu oil. So, is Emu oil safe for dogs? Many pet owners have used emu oil either topically and/or orally on their dogs with great results. Emu oil is very safe for dogs. Even when used topically, you do not have to worry about keeping your dog from licking it. Emu oil has even been used on horses, cats, koalas, kangaroos, birds, ferrets, and reptiles. It’s always recommended, as with any other substance, to introduce emu oil to your dog slowly. Monitor your dog’s reaction and make sure that there are no adverse effects present. Always consult with your veterinarian before using emu oil on your dog. You might need to evaluate your dog’s needs along with his/her diet to determine if your pet really needs emu oil as an additional supplement and/or for topical purposes. How to Use Emu Oil for Your Dog. Emu oil is a very versatile oil that can help your dog heal from many ailments and boost its overall health. Emu oil is so effective for dogs that it can be used both topically and orally. Keep in mind that I am not a veterinarian and that you should always consult your pet’s healthcare provider first before trying any of the following application/consumption suggestions. A few drops of emu oil will go a long way. Apply it directly to the problem area and massage lightly. It will be absorbed pretty quickly. If you’re trying to treat a serious skin lesion or joint pain, you may use it up to twice a day. Always do this under your vet’s approval. If you want to use emu oil internally, a teaspoon or two (depending on weight), twice a day can be effective to treating certain conditions if there are severe. This will help heal your dog from the inside out. When symptoms start to improve, then you can simply use a teaspoon of emu oil added to your dog’s food twice a week or so. There are also commercial products that include emu oil, such as shampoos and pet sprays. One pet owner claimed to make her own spray with part water, part emu oil, and a couple of drops of lavender oil. Whatever you choose to do, always consult with your veterinarian beforehand! “It is important that when selecting the right Emu oil product for your pets skin, especially if you are new to the product, do not just consider the price but also the origin and purity of the product. The market is awash with numerous Emu oil products for pets that masquerade as genuine, while in the real sense they are harmful products that can cause permanent, long-term damage on your pet’s skin. Look out for Emu oil for your pets that are genuine and pure. Why should I use emu oil for my dog? Emu oil is a very safe and versatile oil. It can heal internally and externally, and is especially used in the treatment of a plethora of skin conditions. It also help heal joint pain related to arthritis, restoring mobility to your pets. From boosting your pet’s overall health, to cleaning wounds, heling burns, clearing up irritation, and improving coat and skin, emu oil can become a go to for many veterinarians and pet owners. Are there any side effects to feeding my dog emu oil? Emu oil has been found to be so safe, it’s been reported to have been used effectively on other animals as well. Can give my puppy emu oil? If you need to give your puppy emu oil, then go for the smallest possible dose. Always check with your veterinarian before trying to feed any type of supplement to your puppy. It’s best to wait after 10 weeks of age to start any supplementation program. It may be best to just use emu oil topically. Can I use emu oil on my pregnant dog? Emu oil can be beneficial to your pregnant dog but it’s always best to double check and try to avoid adding anything new to her existing diet. Always consult with your veterinarian first before trying to use emu oil on a pregnant dog. How do I use emu oil for my dog? Emu oil is such a versatile oil that it can be safely used both internally and externally, producing great results. The way you choose to use it will depend on the problem that you are trying to address, following the advice of your veterinarian. The use of emu oil has a lot of benefits not only to humans but to dogs as well. It’s a very efficient way of treating any skin irritations, infections, eczema, wounds, burns, dry skin, etc. It’s also very effective to reducing any type of pain, especially associated with arthritis thanks to its anti-inflammatory properties. Emu oil is able to quickly penetrate deep within the skin to provide its healing properties right away. It restores your pet’s skin health, it has cleansing properties, and it stimulates your pet’s overall wellbeing. The cherry on top for emu oil is that there are practically no side effects to its use, but as with any substance, always use in moderation and under the proper instruction of your dog’s healthcare provider.